I Enhanced My Stash With Yarn Vs. Zombies! Also, A New Project! Perhaps it’s the new year, or perhaps it’s because the planets and stars have aligned, but I’m feeling so renewed lately about my knitting and crafting. The Never-Ending Sock I think had really gummed up the works a bit. It’s finished now, and I still can’t tell you why it dragged on and on. I enjoyed knitting it, I loved the pattern, I didn’t mess it up, I think my crafty mojo just took an end of year break. Who even knows? It’s clearly beyond my ken (please tell me that expression also reminds you of The Sound of Music. Yes? No?). But, now that it’s out of the way, I’m so excited to look forward to all the new stuff I can do. And one of the first things that I’m legit actual peeing myself with excitement about is my first skein of Yarn Vs. Zombies yarn. I ordered it from Kiki late last year, I think as a birthday present for myself, but with everything going on, and my vow to at least finish the gusset of the NES (The Never-Ending Sock, not the Nintendo Entertainment System, although, I’d gladly have both), it sat on my desk in its packaging for a few weeks. Finally, I pulled it out to admire it with fresh eyes, and it’s quite possible that I squealed for no less that eighty-two hours and twelve minutes. Oh em gee, you guys, I love it! Ain’t it gorgeous? It’s the “Tails” base, 100% superwash merino DK weight yarn in the “Tasman Strait” colorway. I love the cool blues, and they remind me of cold water, mist and ice. I’m not perfectly sure what I want to do with it, but I’m leaning towards this pattern, “Scallop Lace Hat” by Leah Coccari-Swift that I found on Ravelry. I think it’s a really beautiful pattern, and will be fun enough to knit but will let the yarn really be the star. What do you think? I’ve also started knitting on some knee-high socks for my Ma’s birthday. She picked them out of the same book that the NES is from, “Knitted Socks East and West” by Judy Sumner, which is good because I know it’ll be a really beautiful and fun pattern (also, now that I’ve worked from two patterns in the book, I’ll be reviewing it soon! Stay tuned!). 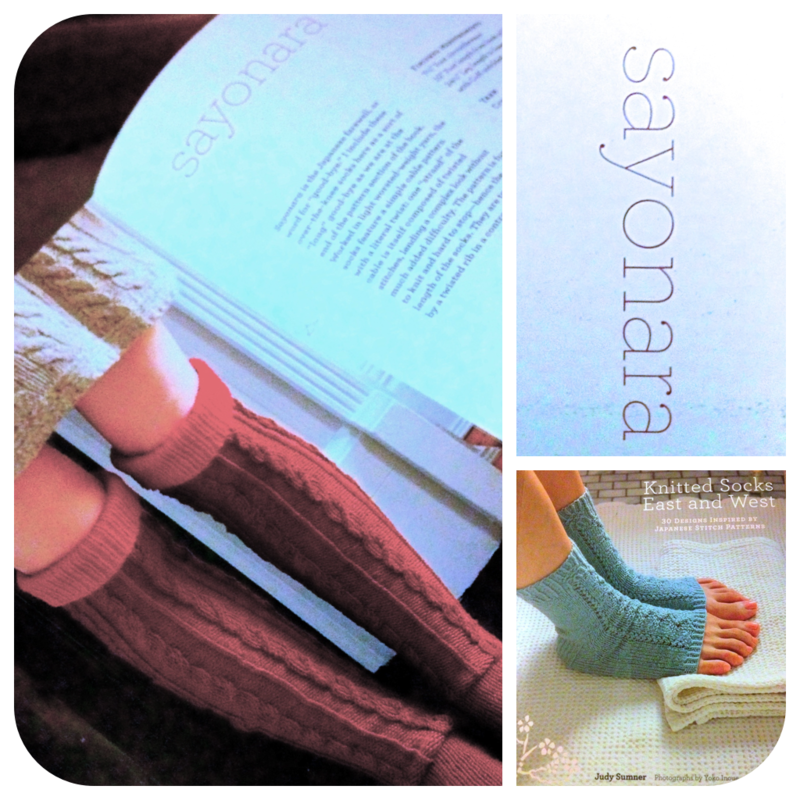 They’re called Sayonara (because they’re the last pattern in the book; hehe, I see what you did there, Judy Sumner! Cheeky monkey. ), and at first I was daunted by their being knee high socks, but they’re in worsted weight so they go WELL fast. I was only an inch or two along when I snapped it for the blog, but I’m already almost twelve inches down the leg. I’m really in love with the cables too (keep in mind I haven’t blocked them so they’re a bit screwing in the pic). It’s a four stitch cable, but on the straight, you do a two stitch cable on one side, which adds that little bit of extra depth and texture to it. I adore it. I hope Mama really likes ’em. Oh! I’m using Rowan Pure Wool Aran for this project. Now, y’all know what a Rowan fan-boy I am, and I am really loving this yarn. I checked out the comments on the Ravelry page for it, and several people were complaining that the balls had a lot of knots per ball, and it was splitting. Now, either those people are totes cray, or there was just a bum lot at one point. I’m nearly through an entire ball and I’ve not had one knot, and I have had ANY problem with splitting, and I’m not even just defending it because I want my coffin lined with balls of Rowan yarn (creepy, but not though. Think about it, wouldn’t that be divine! I’d just be sad that I’d be too dead to enjoy it. But, my ghost would know, and my ghost would appreciate it). I know knots really cause sand-in-the-nethers for some people. I’m not one of them. Knots don’t phase me. From working in a yarn store and talking to yarnie peeps more informed than I, acceptable industry standard is three knots per skein (which still riles some people up, but what can you do?). But, even then, there haven’t been ANY knots in this one so far. I found the twist to be really stable and I’ve not noticed any real issues with splitting. I’m a riDONKulously tight knitter, AND I’m doing cables, so if this yarn was going to split it would be happening to me constantly and it just isn’t. So, I’ll keep going and see if things change, but so far, I’m finding those other complaints not to be true. I REALLY love knitting with this yarn. The only thing I’ve noticed that could prove to be an issue down the track is that it does get a bit of fuzz to it which could lead to pilling. I’ll be super interested to see how it wears though. How is your crafty new year shaping up? Tell me what projects you have planned this year in the comments. Sharing brings me to life, y’all! I Did Some Cheeky Embroidery, Y’All! my gosh, raynie! i’ve been the most busy. luckily, i’m ery close to being able to enjoy some personal projects. that yarn looks fantastic. If only there was always time for personal projects! 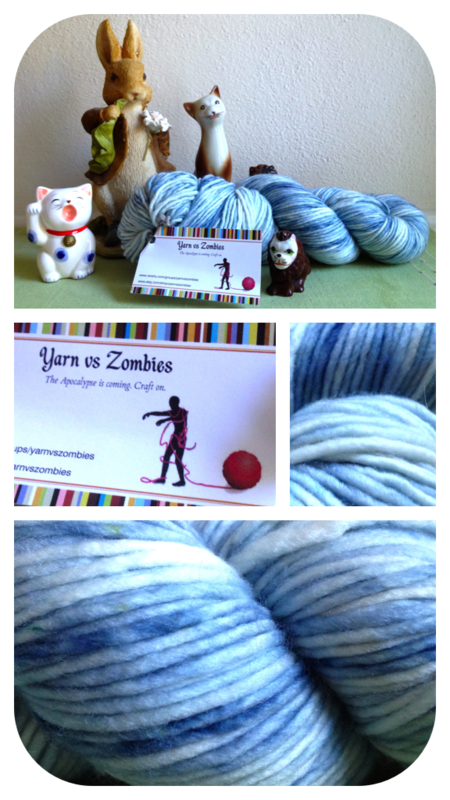 The Yarnvszombies yarn does look super nice, beautiful cool blues. I popped over to see her Etsy shop and it is now on my list for when I have some yarn money to spend. I spent yesterday experimenting with buttonhole methods for my grey tweed cardigan and finally found one that worked out so I’m on the buttonband. Almost done and thinking about next project! ps: and you know this, fellow Rowan fanboy here! I haven’t knitted the YvZ yet, but I squish it all the time. It’s so good! I adore all your cardigan and sweater knitting! That yarn is stunning! I’ve got to get me some Yarn Vs Zombies yarn. I’m looking forward to seeing what you work it up into. Love the cablework in that photo. 2013 has started off with some gusto. I knit two pairs of warm slipper socks for me and my man, a scarf from stash yarn, and now I’m onto a hat for a nephew. I’ve been enjoying some “simple” projects, but they’re just warm-ups for some possibly challenging projects. 2013 is going to be a crazy, good knit year! I want to be wrapped in a Beekeeper’s Quilt shroud, because knitting these itty bitty hexipuffs is going to take me the rest of my life! Also, thanks for the nice words! 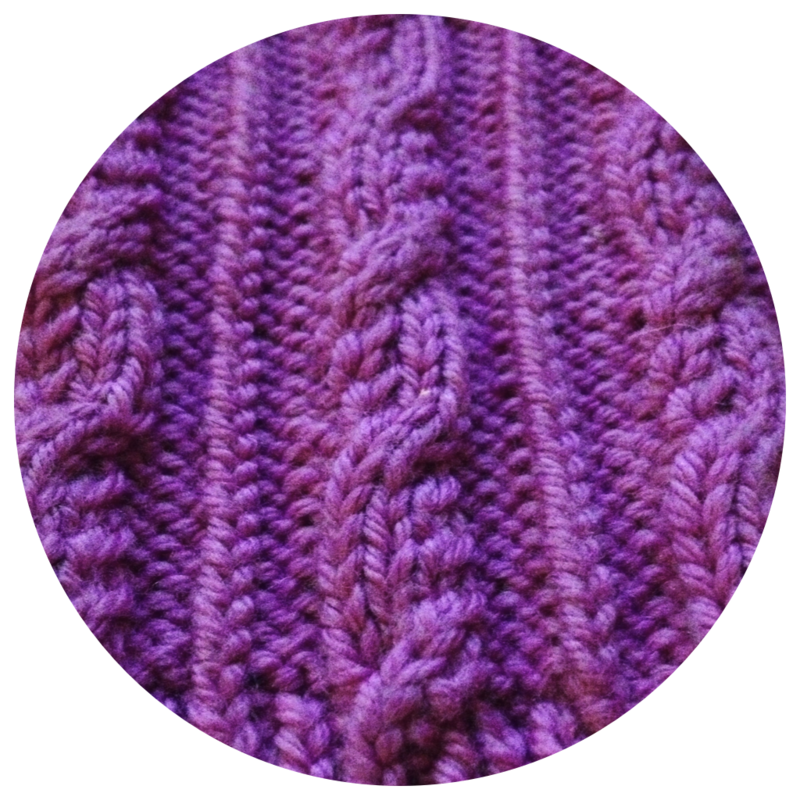 Your photos make the yarn look even better than in real life! My photos aren’t nearly as good as yours! I just cram a bunch of cute brik-a-brak into the frame to make up for any lack in photography skills. hehe. I love the fiber Kiki whipped up and delivered! Could she be any more rad? And love the cables! Such fun! and the cables! LOVE THEM! Greetings, Sir. I wandered over from the SHK Rav group. You love the yarny-goodness, indeed! I haven’t yet knit with any Rowan yarn (it’s on the wish-list) but I would say 3 knots per ball is not acceptable (or kind to the user). I personally do not have good knot “karma” with Noro yarn (i.e. I almost always have knots). I can deal with knots, but knots in a not-inexpensive yarn – known for it’s long, gorgeous color changes? A color change abruptly/rudely broken with a knot is kinda annoying. Hope your weekend and knitting is going well! I found your blog today through Katie and Reuben at House of Humble and I have to say that so far I have managed to burn two burgers and turn three eggs to rubber because I’ve been hooked on your posts ever since my discovery. I personally love the fact that zombies play a part in crafting. I am not in any way crafty but my mother sure is and I am positive that she will appreciate this card so I will share it with her later. Oh wow, I think this is possibly, no make that definitely, the cutest blog I have seen. I’m almost feeling inspired to go crotchet something. Only last time I went to do that, I held the hook in my hand and had no idea what to do with it, it had been that long since I last crotched :-(. I will have to re-learn. Really lovely blog! New to your blog! You are so funny! Thank you for your ideas and quick wit!